Latin American coffee is well known among coffee drinkers for it has its own distinctive taste and aroma. Today, there are several products and brands offering Latin American coffee variant in their catalogue. So, before you sip your next cup, let us introduce you to Ruta Maya Coffee, the Rich and Flavorful Mexican Arabica Coffee. Ruta Maya Coffee is a brand of Latin American Coffee from the same name Company headquartered in Austin, Texas. The Company had a coffee shop located in 3601 S Congress Ave d200, Austin, Texas but was closed temporary in 2012 and then reopen again until now. The company was founded initially for the purpose of creating a marketplace of superior products produced in Latin American Countries and to return the fair portion of profits generated o those farmers. Ruta Maya Coffee Company start from a small business to a well established and highly respected business in Austin. This company coffee product embodies Ecuadorian, Mexican, Mayan, Cuban, Nicaraguan, and El Salvadorian to work together with Texans to adopt a universal message of respect and friendship through economic cooperation. Click here for another Latin American Coffee. The coffee beans used to make Ruta Maya Coffee are 100% organic Arabica that are shade-grown and imported from associated farmers in the Highland of Chiapas, Mexico, which is the land of modern Maya. Coffee beans come from this region has exceptional richness that combines ancient growing techniques together combined with gentle roasting to get the ultimate depth and flavor in the end-product. These coffee beans then brought to Texas, where they are going to get through custom roasting to certain standards and all of them are packed fresh daily. Ruta Maya and farmers in Chiapas produce their organic coffee shade grown among and in rotation with other food crops to enable the farmers to sustain and replenish the land for future generations while at the same time promoting conservation of natural resources. It also helps to empower the Mayan farmers as a viable economic force among the community. 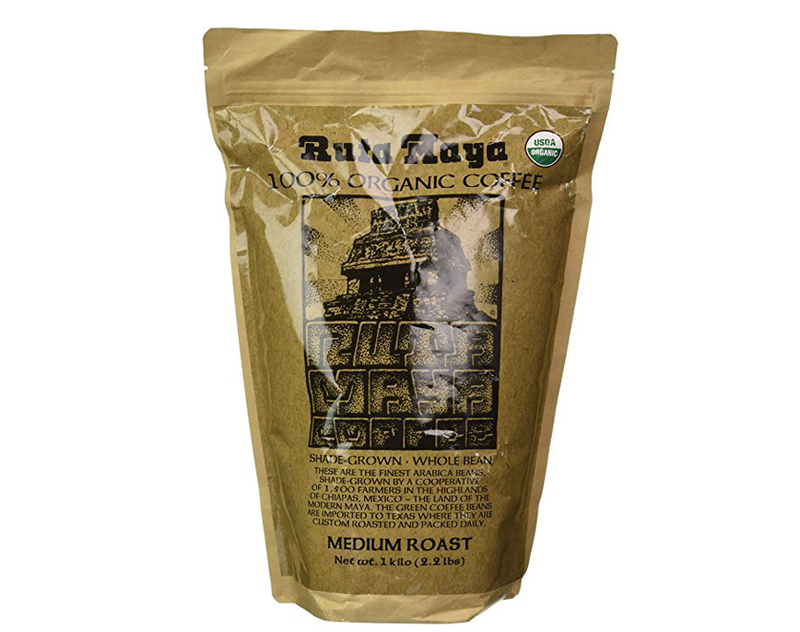 The Ruta Maya product line includes certified organic coffee in medium, dark and espresso roast. Aside from these coffee, they also offer decaffeinate coffee products for those who avoid caffeine, so they can still enjoy the Rich and Flavorful of Ruta Maya coffee. The company also offers them in both end-consumer and bulk package. Other than the original organic coffee Ruta Maya has Cuban coffee called the Jiguani, which also available in medium, dark, and espresso roast. The medium roast of Ruta Maya Coffee brew is browner in color with rich coffee flavor and aroma. The dark roast taste bitter and has darker color but contain less caffeine than the medium roast while decaffeinate version has little to no caffeine content. The espresso is just as the name suggest, it was crafted specially to be used in making espresso, which is finely ground and has considerable strength with inherent sweetness behind. Ruta Maya Coffee is packed using foil lined paper bag that is re-sealable to protect the coffee from light and moisture. Many people love Ruta Maya Coffee because of its pleasant aroma and not too bitter taste, so people who enjoy it can taste the blend of mild acidity with smoothness behind. The coffee is also not very smoky even in the dark roast variant. All in all, Ruta Maya Coffee is a great choice for those who want to get a cup of rich and flavorful coffee. The aroma is very pleasant and the taste is not overwhelmingly strong, so everybody can enjoy it. Click here to purchase the Ruta Maya Coffee.